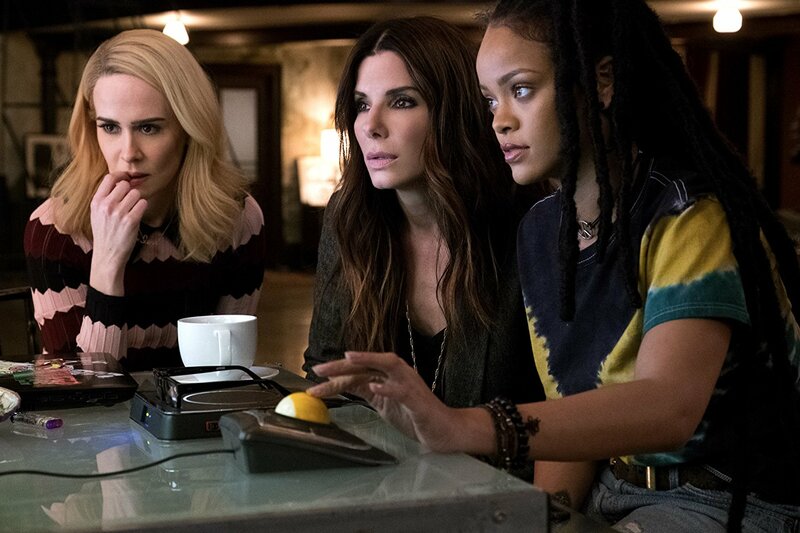 Ocean’s 8 is the best comedic action movie ever! I enjoyed the way the movie flows, as if it’s a normal day stealing a billion dollar necklace.” Abraham F. adds, “I have never seen any other Ocean films and I have to admit that I was pleasantly surprised. The dialogue is realistic and it is really funny.” See their full reviews below. 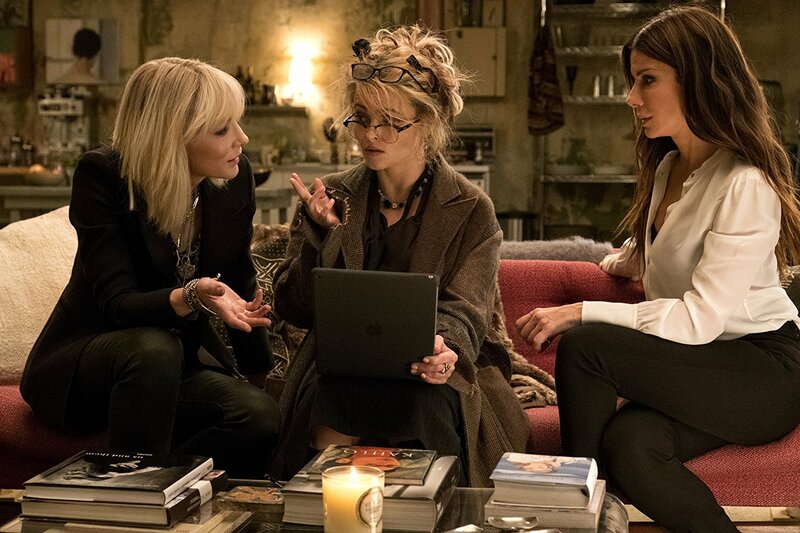 Ocean’s 8 is the best comedic action movie ever! I like it because of the fantastic animation and storyline. I enjoyed the way the movie flows, as if it’s a normal day stealing a billion dollar necklace. The comedy is the icing on a cake. It makes the movie sweet and enticing to watch. The movie’s main character is Debbie Ocean (Sandra Bullock). In the beginning, we see her being released from jail after five years. During that time, she has planned the greatest heist with hidden intentions. Debbie Ocean’s team includes one of her old friends, Lou (Cate Blanchett). 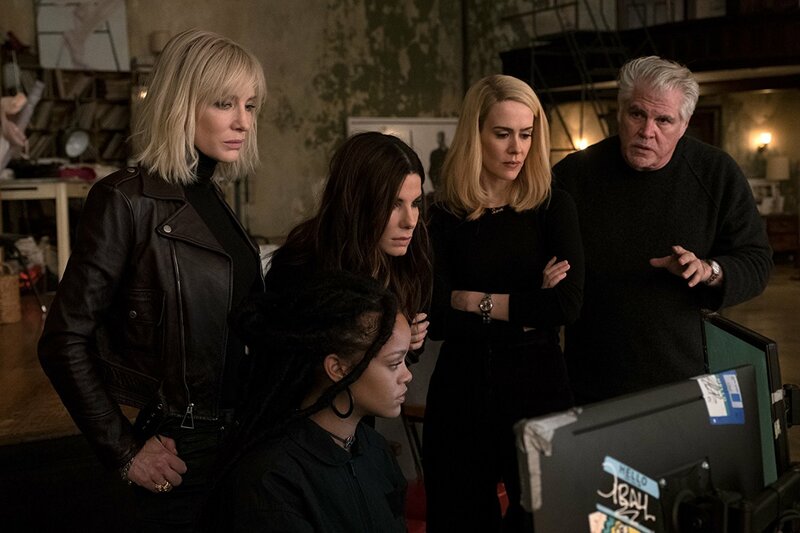 Lou and other highly intelligent cheaters are all part of the team, Ocean’s Eight. As the heist unfolds, it exposes the twists and turns behind the storyline to the audience. Sandra Bullock’s charisma in this role draws you to love her even more. The beautiful Rihanna is also in the film as “9-Ball”, the Jamaican hacker. The amazing actress from 12 Years a Slave, Sarah Paulson plays a caring mother who loves to shop for home goods. In the mix of the film celebrities pop up everywhere. You just have to pay attention to notice them. What I love about the film is the all women cast planning on doing something not good. Most heist movies are about men robbing banks, planning their moves and then executing them. Ocean’s 8 has the same idea, but without the men. The costumes at the Met Gala for each of them are simply amazing and match each character’s personality and abilities. 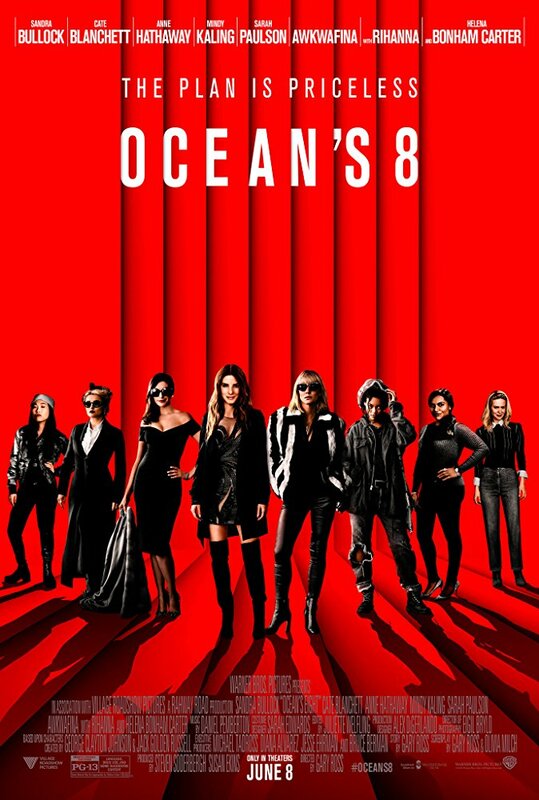 My favorite part is the ending when everything is pulled together, from Debbie Ocean’s release to the creation of Ocean’s Eight. My favorite character is Constance who is pla yed by Awkwafina, because of her funny attitude throughout the film. Also, her pick-pocketing skills blew my mind. 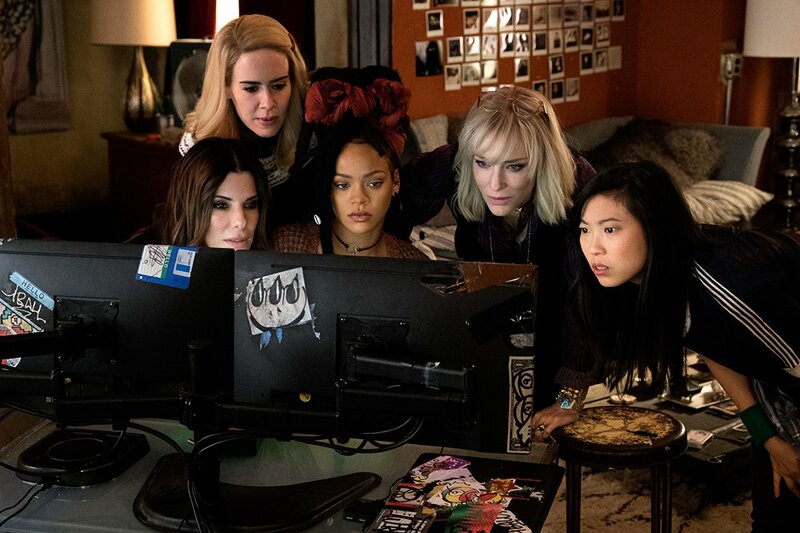 Ocean’s 8 is a movie to enjoy just because it’s an amazing film. I give it 5 out of 5 stars. Some jokes are questionable and there is some mild profanity, but nothing is extreme. I recommend it for ages 14 to 18 because of some language, alcohol and drug usage. It opens in theaters June 8, 2018 so check it out. I have never seen any other Oce an films and I have to admit that I was pleasantly surprised. The dialogue is realistic and it is really funny. There are some flaws. It does feel like a lot of other heist films. For example, it has a recruiting phase where one character is the hacker and another is talented at stealing things. Also Debbie Ocean has been in prison for five years plotting her plan, but her plan doesn’t take into account that technology changes. 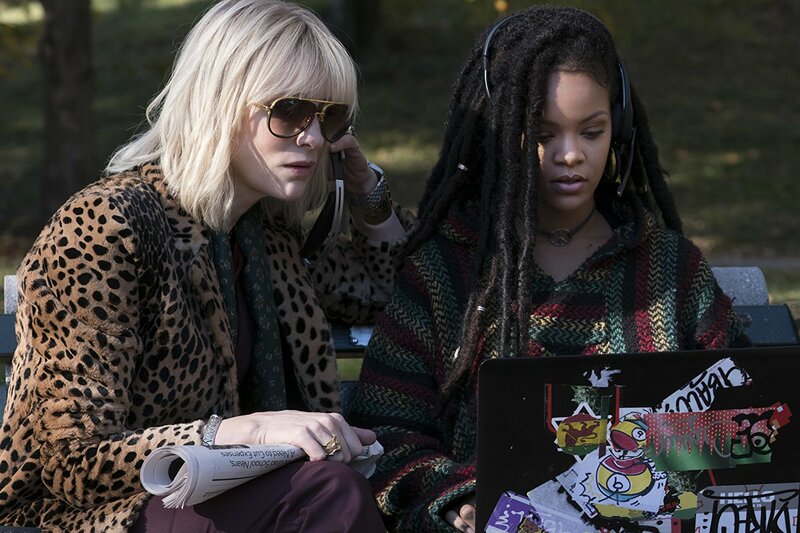 Ocean’s 8 follows Debbie Ocean and her plan to steal a 150 million dollar necklace at the Met Gala. She has spent five years in prison and goes to her friend Lou, who helped her in past crimes and asks her to recruit people for the job. Her plan is to get Daphne Kluger, a world famous model, to wear the Cartier necklace and then they will create a fake one to replace it. After that, she would place one of the gems on the person that framed her with the intent of framing him and making it seem as if he stole it. My favorite part is Rose’s character. She is enter taining and realistic when she tries to comfort Anne Hathaway’s character when her dress isn’t turning out the way she wanted. In another scene, she acts as if she isn’t interested in her and that makes her want Rose to be her designer. There are a lot of big names in this film such as Cate Blanchett (Thor: Ragnarok, Lord of the Rings, Cinderella), Anne Hathaway (The Dark Knight Rises, Interstellar, Colossal). The director is also a really big name too, Gary Ross who wrote Seabiscuit and the Hunger Games. T here is some mild profanity but nothing too extreme. It is a heist movie, so there are lots of risky actions such as hanging from rafters and escaping prison. I recommend this movie to anyone who enjoyed any of the previous Ocean films or other heist movies. I give it 3.5 out of 5 stars and recommend it for ages 12 to 18, as well as adults. It opens in theaters June 8, 2018 so check it out. Coming soon! The One and Only KIDS FIRST! Film Critics Boot Camp June, July and August in 8 Cities Nationwide! Coming to Miami June 18-22! Tweens and teens watch and critique films, interview celebrities as entertainment reporters at KIDS FIRST! Film Critics Boot Camps where learning and fun are one! The KIDS FIRST! Film Critics Boot Camp is coming to eight cities this summer, enabling kids to learn how to become entertainment reporters after spending a week practicing their on- and off-camera skills. Taught by leading producers, directors and filmmakers, children ages 11 to 17 truly have the opportunity of a lifetime in this unique star-making program. The camp comes to Miami June 18-22 at the Doral Academy, then travels to Philadelphia, Old Bridge (NJ), Seattle, Los Angeles, New York City and Washington DC. The KIDS FIRST! Film Critics Boot Camp is designed to offer young people the opportunity to learn the skills they need to critique and review films, present their reviews on-camera and interview celebrities. 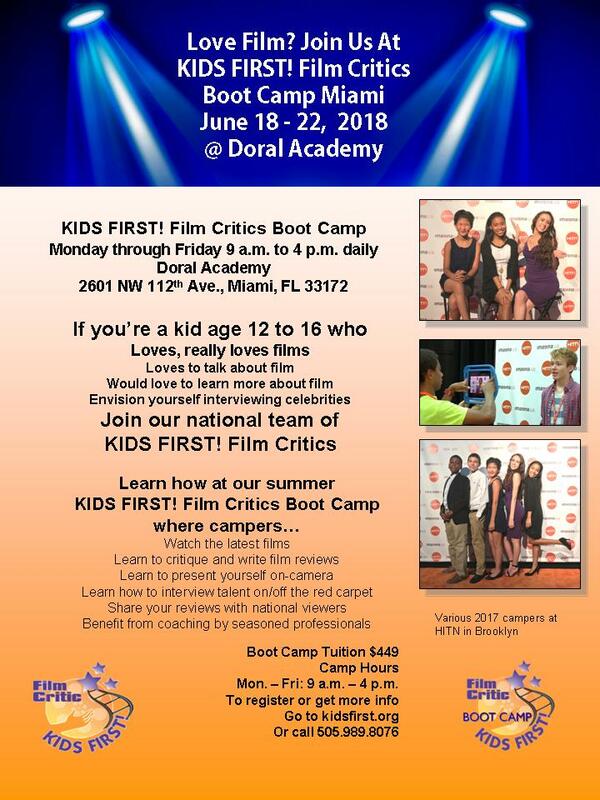 “Children will learn a variety of behind-the-scenes film industry skills as they watch and critique the latest films, write reviews, develop on-camera reporting and interviewing techniques and meet working film critics, celebrities, directors and producers of some of their favorite films,” said Ranny Levy, KIDS FIRST! Founder and President. “It made me improve my vocabulary and write even more because I didn’t use to like writing,” said Angel David Gonzales who participated in the 2017 camp in Brooklyn, NY last summer. The normally shy Gonzalez’s teacher, Madeline Rodriguez commented that participating in the camp boosted his confidence as well. “It’s really nice to see him open up from his shell, to really embrace this experience and opportunity,” she said. Following the camp, campers will have the opportunity to join the KIDS FIRST! Film Critics team of reporters. Check out our coverage by Sandy Kenyon, Entertainment Reporter for ABC Eyewitness News of 2017 New York City camp. 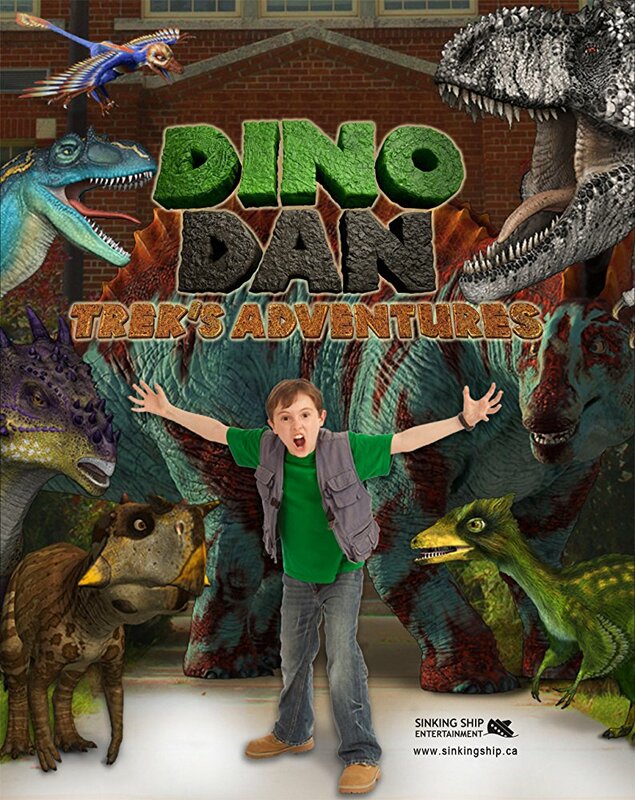 In this complete series set, enjoy 50 dino-filled adventures with junior dinosaur expert, Trek Henderson, as he imagines dinosaurs in the real world! While Trek’s brother, Dan, is away helping his dad, it’s time for Trek to get his own dino time. 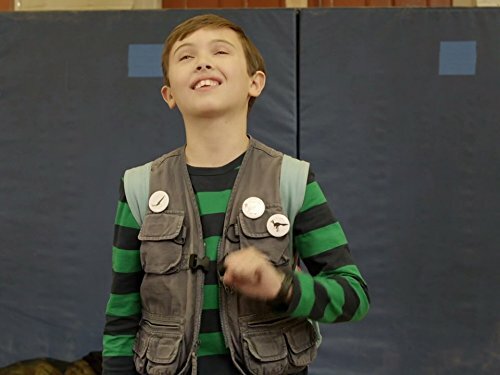 Trek is going to finish some of the experiments in Dino Dan’s Field Guide including seeing at least eighteen dinosaurs that Dan has never seen before! Trek will even meet marine reptiles for the very first time! It’s time to join Trek Henderson as he embarks on one dino adventure after another and all in his very own way. KIDS FIRST! Film Critic Imani G. comments, “Kids will love this series if they have a big imagination and of course, have a love of dinosaurs.” Abraham F. adds, “This series is great for keeping younglings entertained over the summer. With over 500 minutes in its 50 episodes, this will keep them busy and will keep them interested. 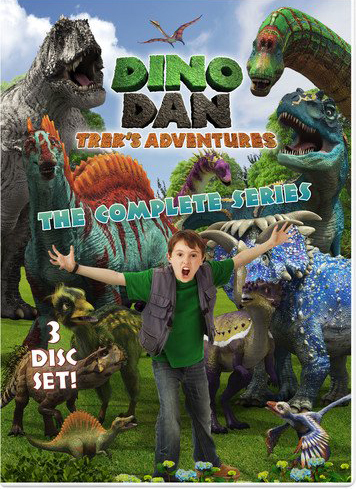 Dino Dan: Trek’s Adventures: The Complete Series is a series for young kids with a lot of excitement, and fun adventures to go on! Kids will love this series if they have a big imagination and of course, have a love of dinosaurs. 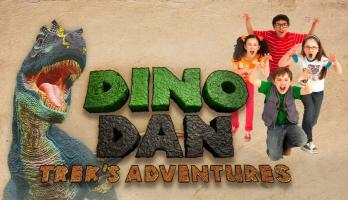 On this DVD, there are 50 dino-filled adventures with the dinosaur expert, Trek Henderson. 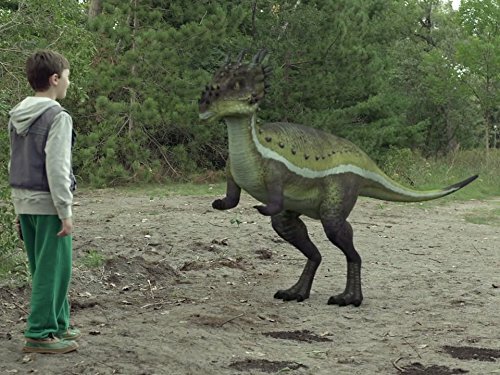 Trek imagines different types of dinosaurs in the real world throughout all of his experiences! While Trek’s brother, Dan is away helping his dad with something, Trek takes over and entertains himself with his dinosaur world. The goal is to finish up some of the experiments that Dan has started. Trek even meets some new dinosaurs and marine reptiles that he hasn’t seen before! Join Trek on his wonderful adventures throughout the world of dinosaurs! One reason I really like this show is how they incorporate educational lessons into it. It’s not everyday that you see a kids TV show that includes all kinds of educational facts within the story line. This is exactly what this series does. For example, in the episode “Trek Rex,” Trek is having trouble figuring out what dinosaur he wants to dress up as for a party. 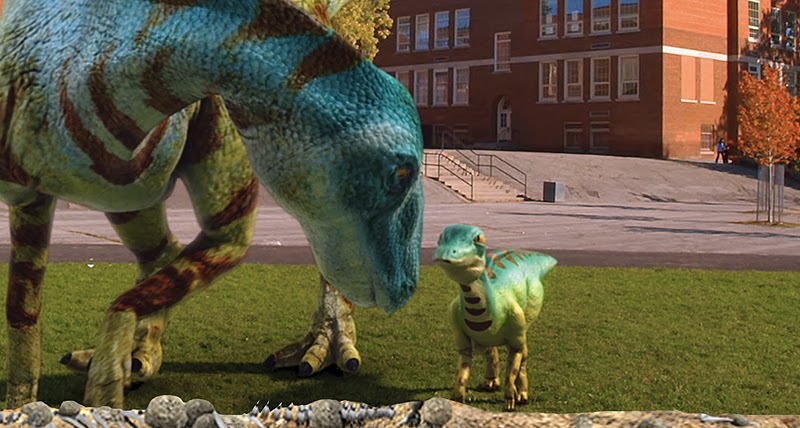 Throughout the episode, he has various encounters with several dinosaurs to help him make his final decision. Trek and the dinosaurs’ encounters happen in the real world, in front of real people, so he is imagining it. I believe that creates a connection between Trek and kids in the real world, since many have big imaginations. The overall message in this series is that it’s okay to have an imagination and even share it with others! Trek has no problem sharing his findings out loud for everyone to see and has no shame about doing that. This is what kids should feel. And, sharing their findings throughout their childhood is a cool thing to do. I rate this show 4 out of 5 stars for its playful storyline, exciting cast, imagination and much more. I would love to see the storyline develop more, but it’s perfect for younger kids. I recommend it for ages 5 through 10 . This is available on DVD now, so check it out. This series i s great for keeping younglings entertained over the summer. With over 500 minutes in its 50 episodes, this will keep them busy and will keep them interested. I found Trek talking to an imaginary dinosaur somewhat strange but hey, it doesn’t seem to bother his mom. The storyline is about when Trek’s brother who goes away to dig up fossils and Trek misses him. Then, one day a package arrives in the mail with a message from Dan asking Trek to help him do some dinosaur experiments. In later episodes, he gets better and better at conducting these experiments. 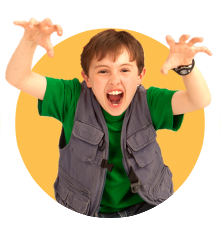 One of his tasks is to find out if albertosaurus hunt in packs. For this, he gets a ham sandwich and gets the albertosaurus to chase him. Trek is played by Trek Buccino who lives in Toronto, Ontario and attended Claude Watson School for the Arts. He has also been in Pacific Rim and PJ Masks. Trek’s mom is played by Allana Harkin who has been nominated for the Primetime Emmy award for Full Frontal which she produced. What I like about the show is that it is enjoyable to watch while you learn some facts along the way. I recommend it for ages 3 to 8 and give it 3 out of 5 stars. It is available now on Digital and DVD/Blu-ray so, check it out. 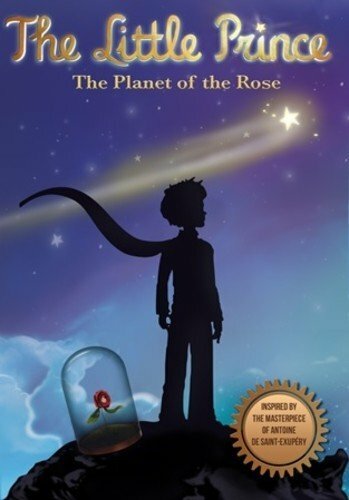 The Little Prince: The Planet Of The Rose – Based On The Classic Book With A Ring Of Positivity. Follow the Little Prince, a hero of multiple generations, as he experiences brand new adventures with iconic characters based on the masterpiece by Antoine de St. Exupéry. 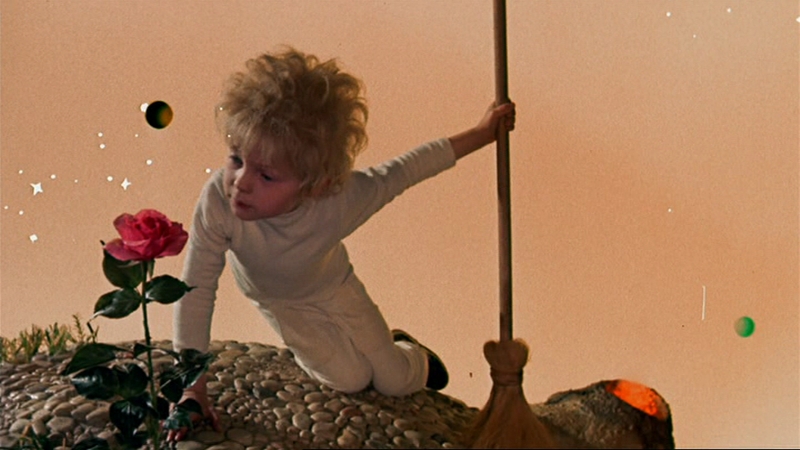 In The Planet of the Rose, the Little Prince believes he has succeeded in getting rid of the Snake after a deadly battle. He can now finally continue to find the Rose’s planet for his dear Rose. When the Little Prince and Rose reach the planet of the Rose, strange crabs live on the surface and are hardly hospitable. There is no trace of vegetation and no trace of the Rose people. Convinced they have reached the wrong destination, the Little Prince is ready to leave when they find some of the people. However, the Rose people are asleep and fossilized. The Little Prince and Rose need to bring them back to life. Unfortunately, that’s not all they will need to do as the Little Prince’s enemy, the Snake, hasn’t died after all. Morgan B., KIDS FIRST! Film Critic, age 13 comments, “Once again, the little prince and the adorable Rose are getting back together and it’s fantastic how everything is all happy and joyous for their reunion.” Kimberly M., KIDS FIRST! Adult Juror adds, “I truly enjoyed watching this show. Based on the book series, it has a ring of positivity to it. 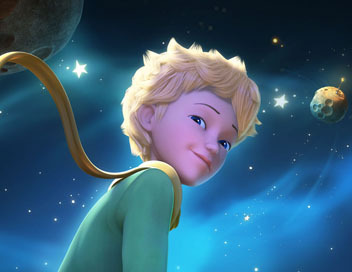 The Little Prince is an incredibly good and popular book series and a wonderfully animated film series.” See their full reviews below. Once again, the little prince and the adorable Rose are getting back together and it’s fantastic how everything is all happy and joyous for their reunion. It ’s very fun and interesting and I absolutely love this DVD. The thing about this story, which is very fun and adorable is that they put a new twist on it. And there are lots of new characters as well as old characters from the series. I absolutely love that they brought the King and the Salesclerk back. I really like that they add new characters to the old ones we love and adore. Everyone will have a character that they can relate to. It is really fun and I love the scene when the Fox comes and they gets knocked off the rope and then he gets to meet the King and the Salesclerk again. It’s a glorious movie, very hilarious and silly, which I like. Also, the Little Prince is, once again, a fantastic character. He is definitely my favorite character because he has a lot of wonderful traits. H e’s very kind and generous, which is glorious. At the same time, he serves as a great role model, and one that kids should see more often. It is good to see someone take their duties seriously, especially helping others. That’s what we get in the prince, all the time. I also love little Rose. She’s very adorable. She is very funny when she is arguing with the Fox. The two of them are just like yin and yang. Now, one thing that is just fascinating about this show is the animation. If you think about it, when you look at it you think, “Wow! I’m stunned.” I think this show is something that will inspire many young children who might think about traveling to another the moon or Mars. I think that idea is fascinating. I have always loved astronauts. That’s what makes this DVD so perfect. The animation is so detailed and colorful and each planet has its own unique twist and turns. By just using words, a little bit of script and then adding all the colors in the DVD make this show perfect. I love that the animation seems to be a mix of anime and origami. They work perfectly together. I really love that this show is something the entire family can enjoy together. I think it’s suitable for ages 5 to 18, as well as adults. I definitely give this 5 out of 5 stars. This is available now on DVD so be sure to check it out! You don’t want to miss this one. I truly enjoyed watching this show. Based on the book series, it has a ring of positivity to it. 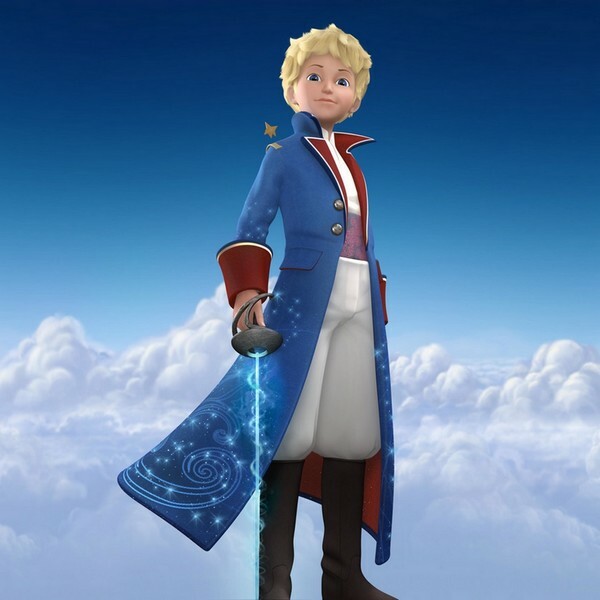 The Little Prince is an incredibly good and popular book series and a wonderfully animated film series. The symbolisms associated with Rose, the Fox and the Snake may be lost on the youngest viewers. However, school age children will benefit from an increased imaginative mindset and the good vs. evil theme. The flow of the story lags a bit at times, but it is quite pleasant to watch. The Little Prince is definitely a positive role model in terms of protecting the ones he loves such as Rose and other protagonists. They all help each other out of peril like when the spirits help Fox from falling into outer space. The computer animation is exceptional. The characters, locale and colors are easy for viewers to identify with. One aspect that really stands out are the geographical indicator s notating inter-dimensional aspects of outer space. The cover design showing the Little Prince looking out into the distance along with Rose is big, colorful and enticing. Young people would enjoy this film because it is adventurous, the setting is unusual and the graphics are terrific. The Little Prince series is based upon the teachings of Saint Exupery and holds morals based upon religious values. Although secular in tone, the theme of good overtaking evil is important for children to hear in order to give them hope in this world. The adventure of outer space will draw most children in. This film might get children thinking about other planets and the science of astronomy and geography. It definitely will expand their imaginations. Questioning and probing take place. For example, when the Little Prince talks about traveling to the Rose planet and the Geographer states that they might possibility be “lost forever in infinity” while tr ying to voyage there. 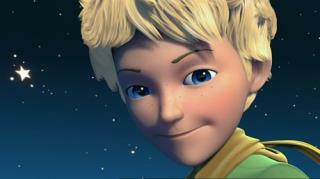 The Little Prince determines it is worth the risk for Rose. There are no bonus features on the DVD. One issue I have is that when you stop the movie and come back to it later, it starts all over at the beginning. It does not start where it left off, which is a nuisance. Also, there are no foreign language subtitles, which is something I missed. I give this 4.5 out of 5 stars and recommend it for ages 8 to 13, as well as adults. It is available on DVD now, so check it out. 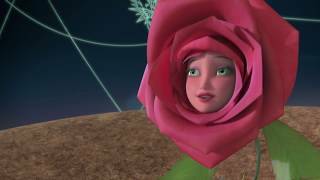 Posted in DVDs Released | Comments Off on The Little Prince: The Planet Of The Rose – Based On The Classic Book With A Ring Of Positivity. 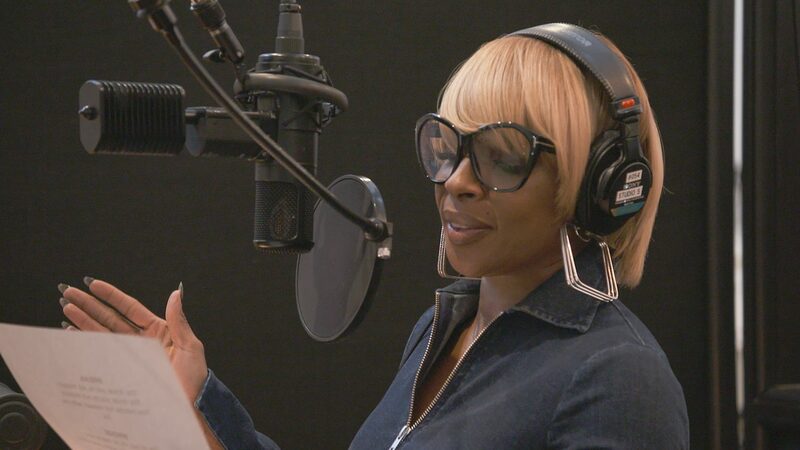 Boasting an all-star cast of voices including Johnny Depp, Emily Blunt, James McAvoy and Mary J. Blige, SHERLOCK GNOMES is a rollicking adventure from John Stevenson, the director of Kung Fu Panda, Shrek, Sinbad: Legend of the Seven Seas and more! When Gnomeo (James McAvoy) and Juliet (Emily Blunt) discover their friends and family have gone missing, there’s only one gnome to call – the legendary detective Sherlock Gnomes (Johnny Depp). Working together, the mystery takes them beyond the garden walls and across the city on an unforgettable journey to save the day and bring the gnomes home. The Blu-ray Combo Pack is loaded with nearly 45 minutes of bonus content including profiles of the all-star cast (Johnny Depp, James McAvoy, Emily Blunt) and learning how this hilarious family adventure was brought to life. Plus, the new music video “Stronger Than I Ever Was” is featured along with learn to draw lessons. KIDS FIRST! Film Critic Lucia F. comments, “My favorite aspects of this movie are the music, Johnny Depp and the “planning” sequences. I love the song choices used in transitions between scenes. If you are a fan of Sir Elton John, you will be pleased to hear many of his hits, including “Don’t Go Breaking My Heart,” “I’m Still Standing,” “Saturday Night’s Alright for Fighting” and a fantastic new song performed by the great Mary J. Blige.” Damon F. adds, “Sherlock Gnomes is a great movie! I really like the storyline because it has an amazing good versus evil plot.” Benjamin P. wraps it up with, “Sherlock Gnomes is a frequently clever animated film that has a few fun moments, yet suffers somewhat from a jumbled story and too many characters to fully engage you.” See their full reviews below. Breaking news from London – garden gnomes have been kidnapped! “Oh fertilizer!” T his is one of many amusing jokes from the very British characters in Sherlock Gnomes, sequel to the 2011 animated film Gnomeo and Juliet. Although the plot of this family-friendly movie is somewhat predictable, it is still quite funny and clever. In this sequel, the formerly star-crossed lovers Gnomeo (James McAvoy) and Juliet (Emily Blunt) are married and have just moved to London where they are appointed by their parent s as joint heads of the garden. Both Juliet and Gnomeo feel the pressures of their new leadership roles and the marriage begins to suffer through lack of communication and mutual appreciation. Meanwhile, their gnome friends are disappearing from homes all over London, and they attempt to search for and save them. With the help of Sherlock Gnomes (Johnny Depp) and Watson (Chiwetel Ejiofor), the adventure begins – to defeat the evil pie company called Moriarty (Jamie Demetriou) and save all gnomes. We also see that poor Watson is quite ignored and u nder-appreciated by Sherlock. The message of this story is a good one – that you will succeed by respecting the people who support you. Sherlock learns that lesson when he realizes that Watson feels that Sherlock isn’t listening to him or respecting him. Juliet learns it when she realizes that Gnomeo feels as if Juliet is ignoring him, too. I rate this film 5 out of 5 stars because, almost all the scenes kept me laughing, the music is great, and I love the message. I recommend this movie for ages 7 to 18. This is available on DVD/BluRay June 12, 2018 and on Digital June 5, 2018. If you are looking for a fun family movie, this is it! Sherlock Gnomes is a great movie! I really like the storyline becaus e it has an amazing good versus evil plot. The story follows Gnomeo and Juliet’s move to London where they become the new leaders of the garden. On their first day, somebody kidnaps all the gnomes in the garden! Luckily, Sherlock Gnomes and Watson are there. Gnomeo and Juliet help Sherlock save all the gnomes in London. The animation in this movie is excellent. The gnomes loo k like real life gnomes with a small touch of cartoon. I like how, in the beginning, a couple of gnomes are standing on a book talking about how they are going to read about Sherlock Gnomes. Sherlock Gnomes is a great detective just like Sherlock Holmes, but instead of protecting people he is the sworn protector of Gnomes. This gives the feeling that the entire movie is about those three gnomes reading us a book about Sherlock Gnomes. The movie has lots of characters named from other movies and books such as Gnomeo and Juliet whose names are take offs of Romeo and Juliet. 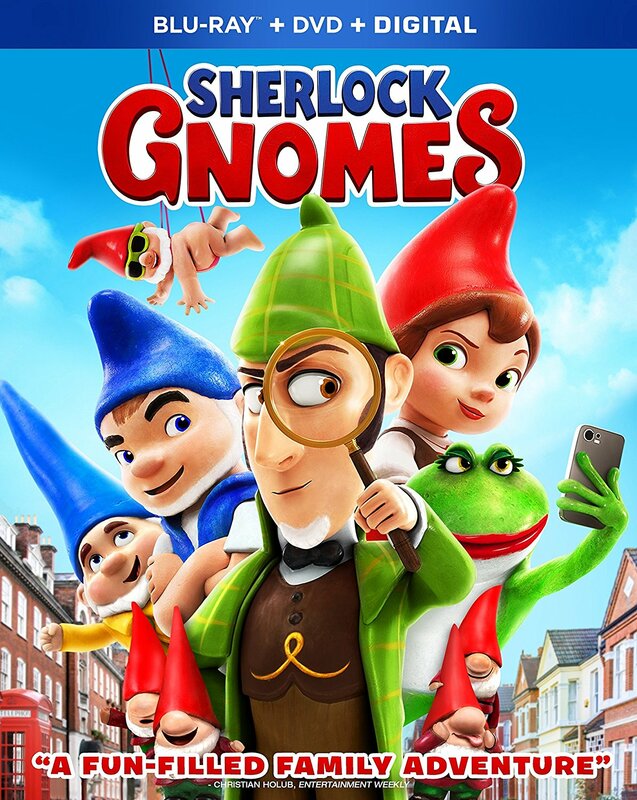 Sherlock Gnomes is based on Sherlock Holmes. I like how the gnomes freeze around humans. They just stay completely still so humans don’t realize they move. The frozen position is also what they do when fall asleep. As soon as they get frozen, they can choose to fall asleep instantly or not. The characters in the film include Gnomeo (J ames McAvoy), Juliet (Emily Blunt), Sherlock Gnomes (Johnny Depp) and Watson (Chiwetel Ejiofor). My favorite character is Benny, (Matt Lucas) because he is smart with technology, but otherwise very clumsy. I find that funny. My favorite scene is when Benny trips and he is forced to put on a show to distract the guard while Gnomeo escapes. That scene is a mix of action and comedy. Another of my favorite scenes is when Gnomeo comes up with a plan to get past Reggie the gargoyle (Dexter Fletcher). I like how they show the plan with paper versions of all the gnomes. T he message of this movie is never take advantage of your friends. I rate this movie 5 out of 5 stars and recommend it for ages 4 through 11 because of its great storyline and message. I think adults will like watching this movie as well. It comes out on DVD/Blu-ray June 12 and on Digital June 5 so, be sure to check it out. You are currently browsing the KIDS FIRST! News weblog archives for June, 2018.